I recently signed a birthday card I’d bought for an old friend several weeks earlier, which read “…let’s celebrate with cake”, when I suddenly realised that unless I actually made a cake, there wouldn’t be one to celebrate with. It was all a bit 'lastminute.com', but not wanting my birthday message to seem disingenuous, I had no choice but to set to with the task I’d unwittingly assigned myself. I didn’t have enough time to bake, fill and decorate a proper birthday cake. However, my predilection for strong coffee and a small chunk or two of very dark chocolate every morning was the inspiration for these quickly made Primal Choca Mocha Brownies. When I first conceive a recipe idea I don’t have a clue how it will turn out - and clearly someone’s birthday isn’t the best time to experiment - but I figured that whatever the outcome at least he’d know I cared. Oh boy, it seems I did care and then some! My friend’s birthday surprise cake was an even bigger surprise for me! 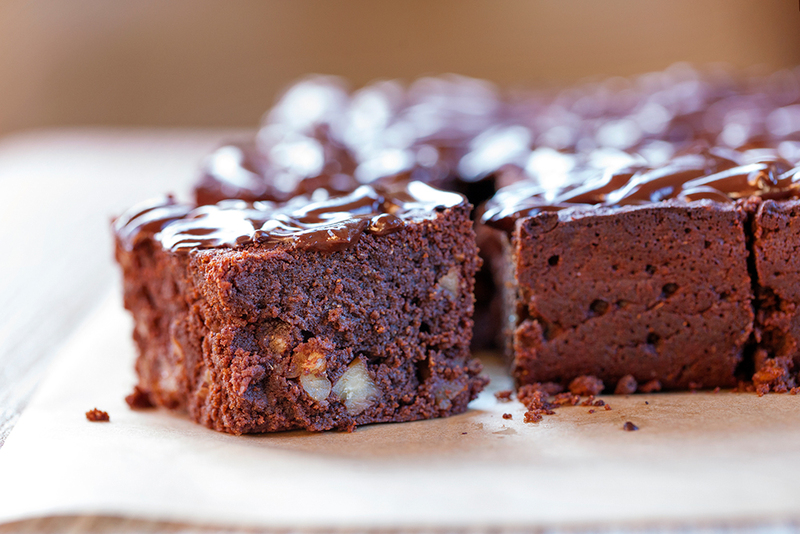 As brownies go, these gorgeous, fudgy, bittersweet, chocolatey pieces of heaven simply knock the socks off the rest. And without added sugar or grains, they’re healthy to boot. Whilst my blogging has suffered a lot of downtime lately because of other more pressing commitments, behind scenes the research and cooking continues. I’ve avidly been testing out various low-carb sweeteners and I think I’ve found a new best friend: Tagatose - is a natural sugar substitute derived from dairy products, fruits and cacao. It only has 38% of the calories of sugar, a very low glycemic index of 3 and no nasty aftertaste. Straight out of the packet, it looks like sugar, tastes like sugar and most importantly, it seems to behave like sugar, which I think will open up many more exciting recipe opportunities for me to share. For now, it’s made its debut appearance in this brownie recipe and in my view, they taste all the better for it. Sarah on her 1st birthday, fully immersed in her first chocolate cake experience. My youngest daughter Sarah was born a chocolate ‘fiend' and she simply can’t get enough of Primal Choca Mocha Brownies. True, her preference for sickly-sweet 20% Cadbury’s Dairy Milk when she was one year old has evolved into desire for the militantly healthy, mellow bitterness of 85% dark chocolate that she enjoys today - its deep chocolatey flavour further enhanced in this recipe by the addition of coffee. But it’s not just Sarah. When our decorator was offered a square of this rich chocolate cake he thought it was so good I should be making my brownies to sell to M&S! No doubt Sarah will protest when the last crumbs from the last batch of brownies are eaten but with Christmas just around the corner and a bag of tagatose beckoning, the food blogger in me is excited to try and create a previously impossible-to-make keto version of an impressive looking dessert that just happens to be my eldest daughter Elizabeth's favourite. Fair’s fair - so girls, let there be no sibling rivalry! The rule is if it works, I’ll share…hopefully, with enough time to spare so it can grace every Christmas dessert table. Primal, Paleo, keto, low-carb or simply health conscious, if I can pull this one off, you’re going to love it. Watch this space! Meanwhile, I invite you to try your hand with these bad boys. Note to Sarah: I’m brownied-out for now, so this means you too! As my foray into baking ‘instant’ b’day cake shows, they can be made, baked, cooled and eaten within 2 hours. I think you’ll agree it’s time well spent for making something so amazing. Pre-heat the oven to 180℃ / 350℉ / Gas mark 4. Grease a deep sided, square brownie baking tray (mine measured 19½ cm x 19½ cm) and line the bottom and sides with non-stick (parchment) paper. A single piece of paper cut an inch or so bigger than the dimensions of your baking tray and then cut down into each corner (with a pair of scissors) so the paper sits flat in the tin is the easiest way to do this. Melt the butter in a medium saucepan over a very low heat. When it is melted take it off the heat and stir in the chocolate, which will melt down in the warm butter without spoiling. Allow to cool slightly. Put the eggs, tagatose and vanilla essence into a large bowl and whisk together until you get a pale, thick, fluffy foam. I used an electric whisk, which took about 5 minutes. Stir in the melted chocolate and butter mixture, then fold in the tiger nut flour, ground almonds and chopped pecans. Finally, stir in the espresso and coffee essence to loosen the mixture a little, then pour into the prepared tin. The mixture should be just soft enough (though not runny) to find its own level in the tin but you may need to spread it out evenly with a flat spatula. Bake for 25 minutes - test with a cocktail stick, it should seem ever so slightly undercooked i.e. a few moist crumbs should stick to the cocktail stick when you withdraw it. Cool in the tray, then remove from the tin with its lining paper. Lay the paper with the cake still on top onto a work surface and, with a sharp serrated knife, cut into 12 even squares. 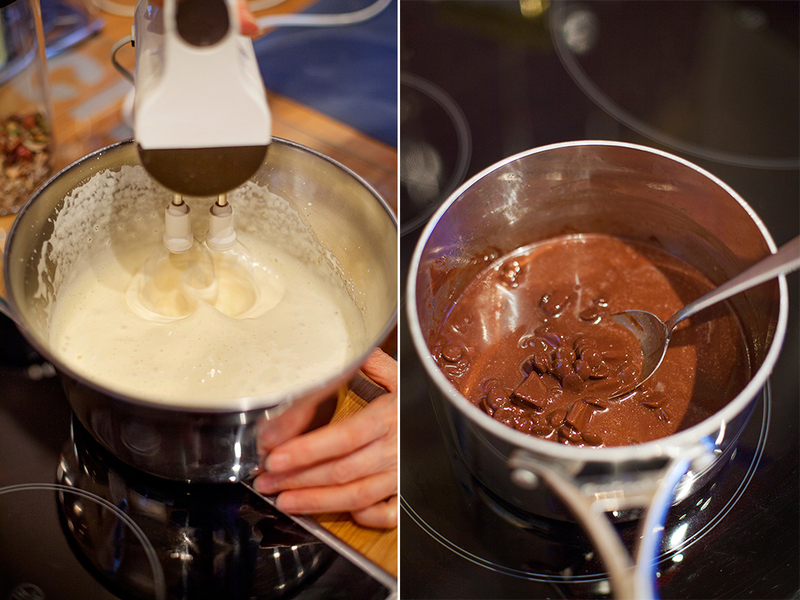 Next, make the chocolate ganache: Gently warm the chocolate and coconut milk together in a small saucepan, stirring all the while until the chocolate melts into a smooth, pourable sauce. N.B. Don’t overheat as this will cause the mixture to split. 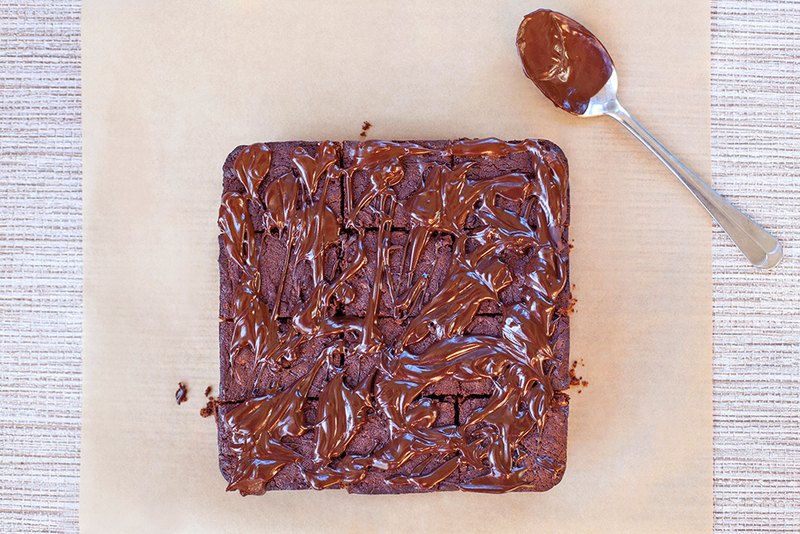 Using a metal tablespoon, drizzle the ganache randomly but generously over the brownies. Leave the ganache to set before fully separating into squares ready for serving. These brownies will keep well, stored in an airtight container, for up to 3 days.